Cairo Santos’ 34-yard field goal hit the left upright and bounced through as the expired Sunday night to give the Kansas Chiefs a 30-27 victory over the Denver Broncos on Sunday night. 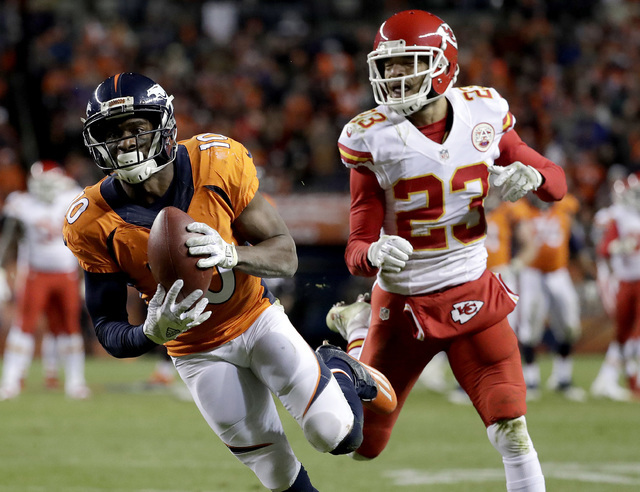 DENVER — Cairo Santos’ 34-yard field goal hit the left upright and bounced through as the expired Sunday night to give the Kansas Chiefs a 30-27 victory over the Denver Broncos on Sunday night. That avoided the third tie in the NFL this season, something that hasn’t happened since 1973 before the league introduced overtime. The winner followed a risky move by Broncos coach Gary Kubiak, who sent his kicker out for a 62-yard try with 1:01 left only to see Brandon McManus — who has hit from 70 yards in training camp — come up short. “It’s on me,” Kubiak said, explaining he made the move because he had confidence in his kicker. That gave the Chiefs possession at the Denver 48 with one timeout and just over a minute remaining. 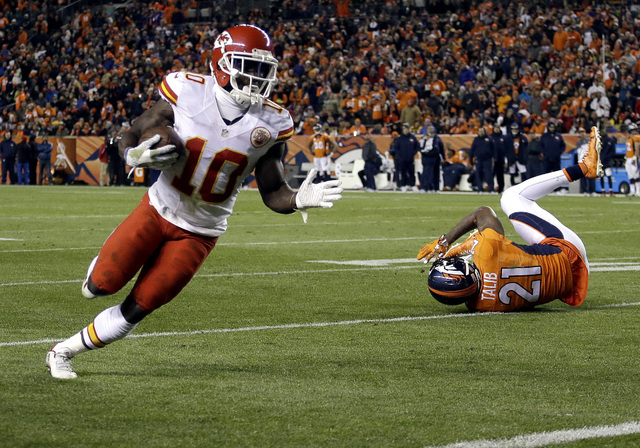 The Chiefs reached the Denver 16 before Santos ended the snoozer-turned-thriller in perfect fashion. Even his teammates hesitated as they ran out to celebrate, unsure if the ball had clanked through or not. The Chiefs (8-3) kept up with the Oakland Raiders (9-2) in the AFC West race and the Broncos (7-4) could find themselves fighting for a wild card now. Both teams kicked field goals on their opening possession of overtime, McManus from 44 yards and Santos from 37. That followed Kansas City’s amazing tying drive in the final 3 minutes of regulation. Alex Smith threw a 3-yard touchdown pass to rookie Tyreek Hill and a 2-point conversion pass to tight end Demetrius Harris with 12 seconds left to tie it at 24. INJURY UPDATE: Denver RB Kapri Bibbs was evaluated for a concussion after a helmet-to-helmet hit from S Eric Berry but returned later in the first quarter. Houston left for a few series but returned and the Chiefs never announced what his injury was. Chiefs: K.C. continues its brutal road swing with a trip to Atlanta next weekend.